A kite has one set of opposite interior angles where the two angles measure and , respectively. Find the measurement for one of the two remaining interior angles in this kite. 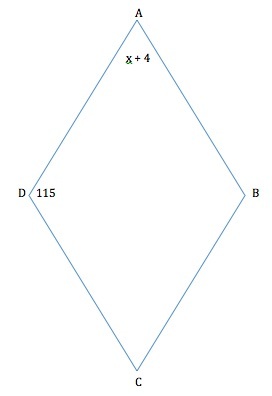 degrees, where is the number of sides in the polygon. By definition, a kite is a polygon with four total sides (quadrilateral). The sum of the interior angles of any quadrilateral must equal: degrees degrees degrees. Additionally, kites must have two sets of equivalent adjacent sides & one set of congruent opposite angles. A kite has one set of opposite interior angles where the two angles measure and , respectively. Find the measurement of the sum of the two remaining interior angles. To find the sum of the remaining two angles, determine the difference between degrees and the sum of the non-congruent opposite angles. This means that is the sum of the remaining two opposite angles. If the diagonals of the quadrilateral above were drawn in the figure, they would form four 90 degree angles at the center. In degrees, what is the value of ? (2) one diagonal is the perpendicular bisector of the other diagonal. Given the information in the question, we know (2) is definitely true. To find we must first find the values of all of the angles. The sum of angles within any quadrilateral is 360 degrees. In a particular kite, one angle that lies between congruent sides measures , and one angle that lies between non-congruent sides measures . What is the measure of the angle opposite the angle? Iowa State University, Bachelor in Architecture, Architecture. Brown University, Bachelor of Science, Psychology. University of Pennsylvania, Doctor of Philosophy, Psychology.